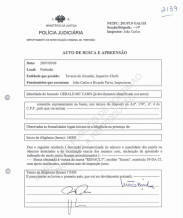 Official document of search and seizure. 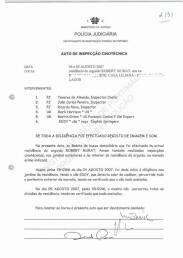 Legal formalities having been observed a search was undertaken. - The present search was started at 18h00. - The residence comprised: entrance hall; a WC (01) on the left; twins' bedroom; visitors' bedroom with WC en suite; master bedroom [bedroom of the couple]; lounge; dining area; WC and kitchen. - All outside rooms [annexes] searched nothing was seized. 1. 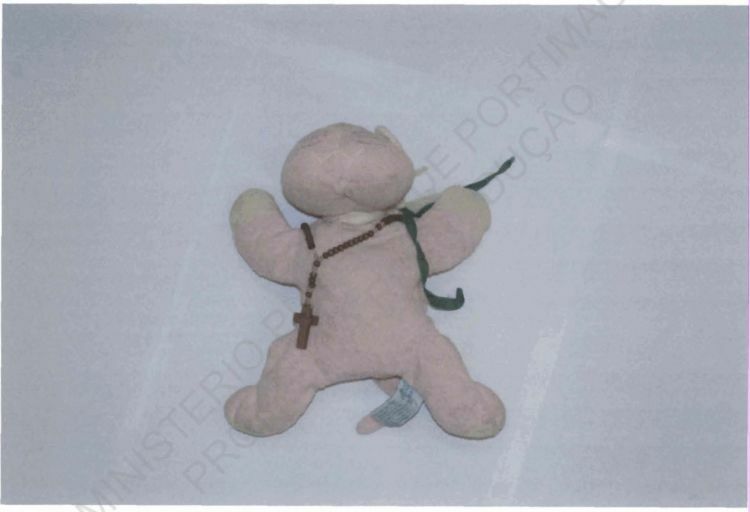 One (01) pink cloth toy, with yellow paws and ears and blue label, make "cuddle cat", with a third in wood and a green band, alluding to Fatima, that was found in the lounge on top of a large chair [armchair]. - Master bedroom, two boxes. - Twins' bedroom, one suitcase. - Visitors' bedroom, one suitcase. - One bible, bedside table of the master bedroom. 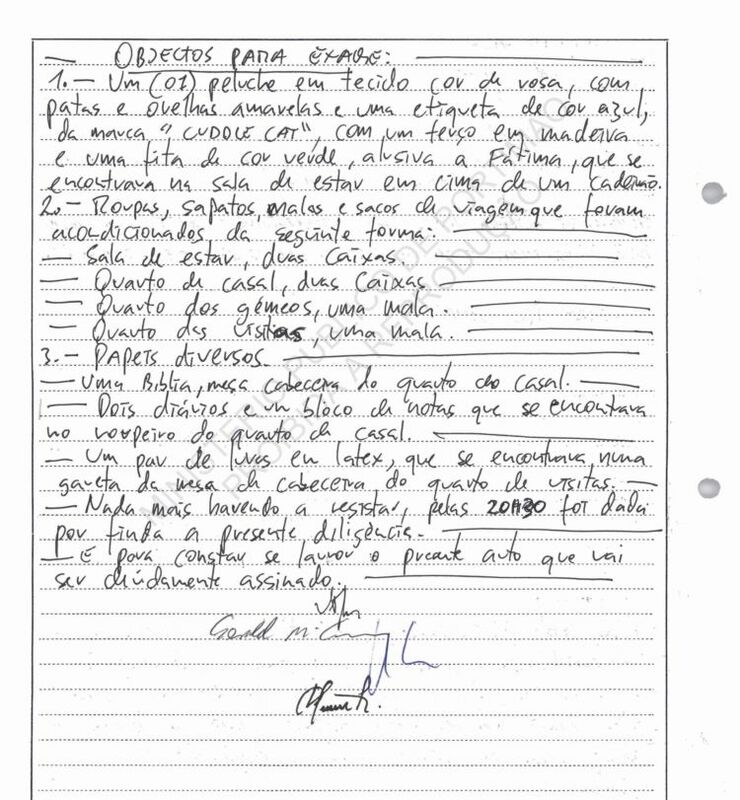 - Two diaries and a notepad that was found in the cupboard of the master bedroom. - On pair of latex gloves, that was found in a drawer of a bedside table of the visitors' bedroom. 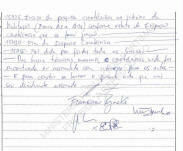 - There being nothing more to record, the present activity was ended at 20h30. 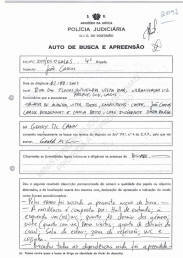 - This document is drawn up to ratify the truth of the above and it is going to be duly signed. 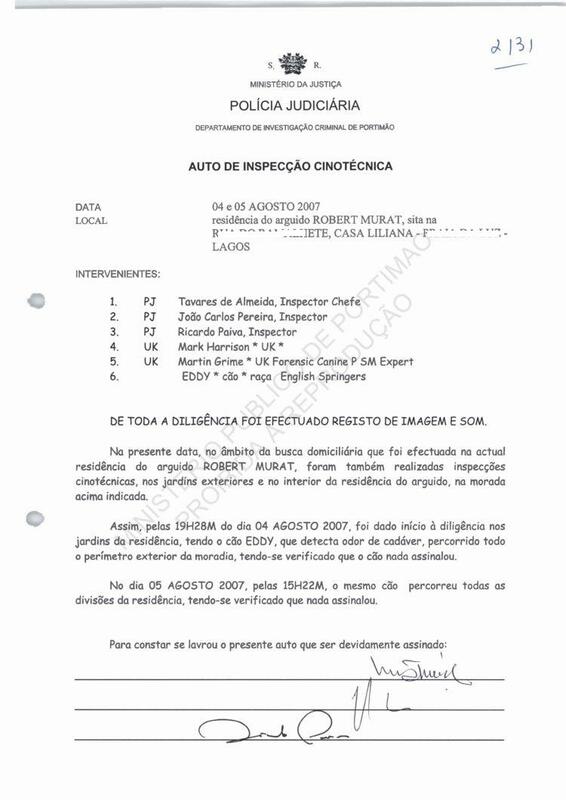 Official record of the canine inspection at 18h14 on 2 August 2007 at the current residence of the McCann couple situated at Rua das Flores, 27, Praia da Luz, Lagos. 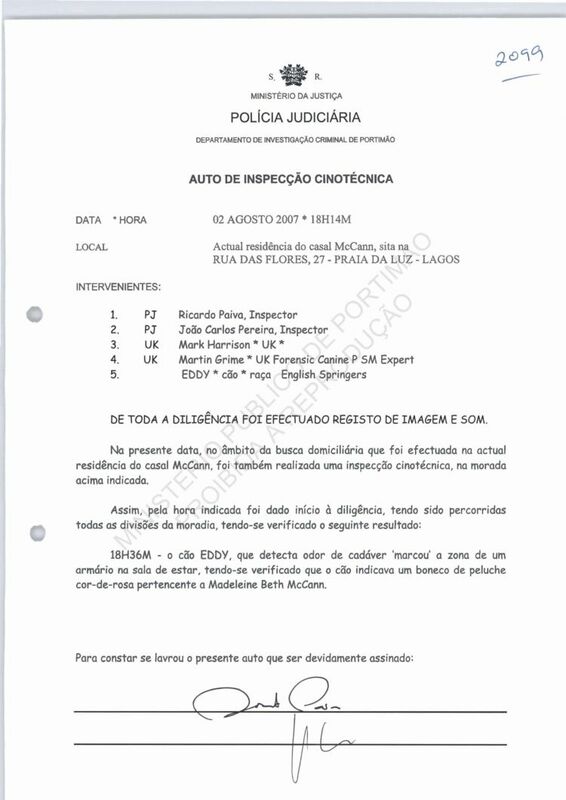 The five participants are indicated as two PJ Inspectors; UK NPIA officer (Harrison); UK dog handler (Grime); UK English Springer spaniel (Eddy). The entire activity was recorded on video image and sound. As part of the residence search performed today at the above address, a canine search was also conducted. 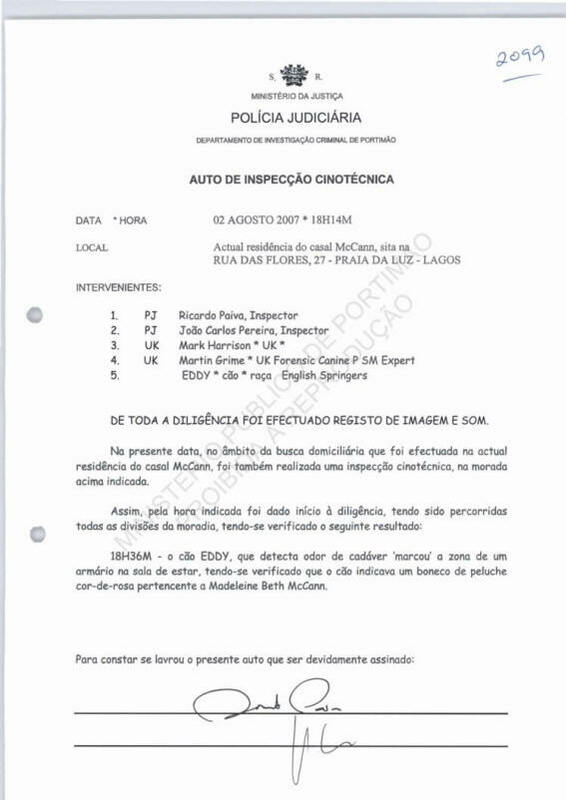 - 18h36 - the dog Eddy, that detects cadaver odour, 'marked' [alerted in] the area of a cupboard in the lounge, it being confirmed that the dog indicated a pink soft toy belonging to Madeleine Beth McCann. 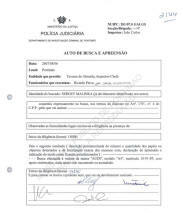 This document is drawn up to ratify the truth of the above and is duly signed. 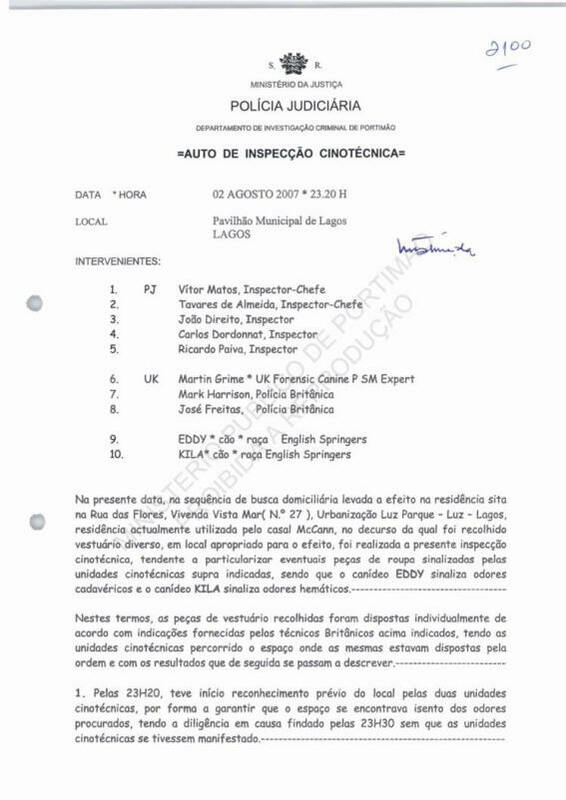 Official record of the canine inspection at 23h20 on 2 August 2007 at the Municipal Pavilion of Lagos, [situated in] Lagos. 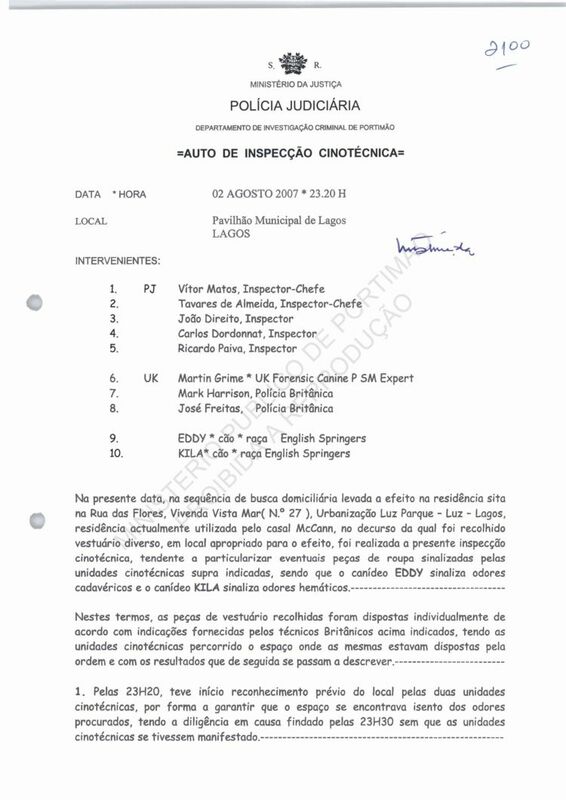 The ten participants are indicated as being five PJ Chief Inspectors (2)/Inspectors (3); The UK NPIA officer (Harrison); the UK dog handler (Grime); the Portuguese-speaking officer from Scotland Yard (Freitas); and the two UK English Springer spaniels - Eddy and Kila. 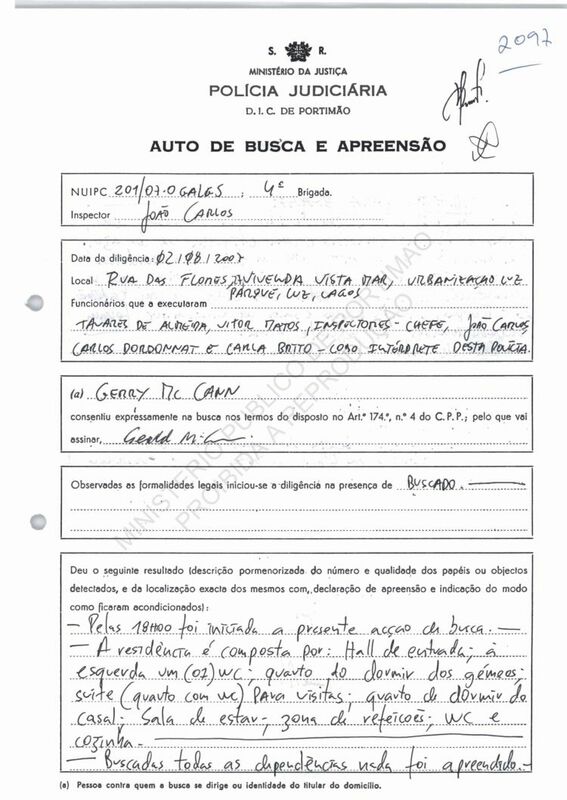 Following the search effected at Rua das Flores, 27, during which certain items were seized, this present inspection was performed, in a place appropriated for its purpose, attempting to identify particular pieces of clothing possibly indicated by the dogs, namely Eddy [that] indicates cadaver odours and Kila [that] indicates blood odours. In these terms, the pieces of clothing recovered [from the home] were laid out individually in accordance with instructions given by the British technicians, the dogs [then] walking the area where they [those pieces of clothing] were laid out by order and with the following results described below. 1. 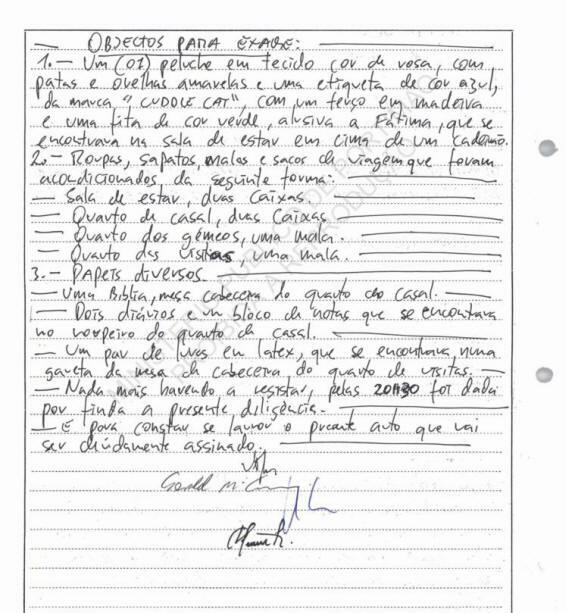 Between 23h20 and 23h30 the two dogs were allowed to reconoitre the entire area to guarantee that there were no existing odours - and none were detected by them. 2. 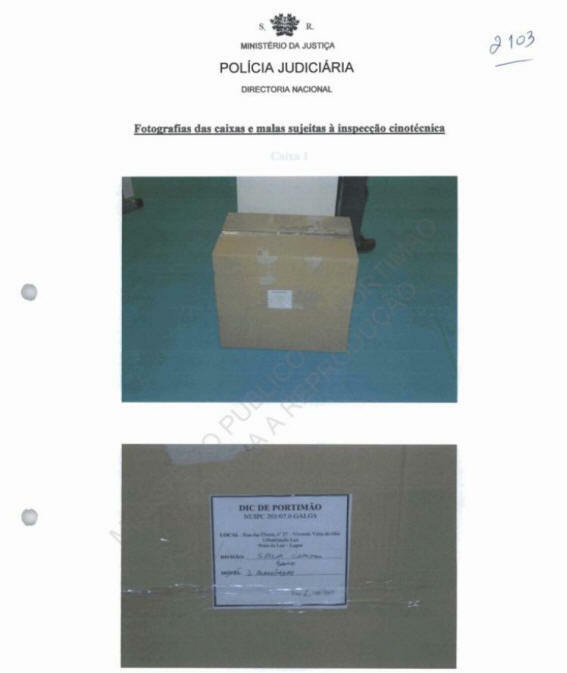 Between 23h30 and 23h40 items from the box labelled 'common room' were inspected by the blood dog without result. - At 23h41 the cadaver dog began its inspection and 'marked' some clothing on the edge of the area. The inspection ended at 23h52 with the clothing having been collected for later direct examination and photographic report. 3. 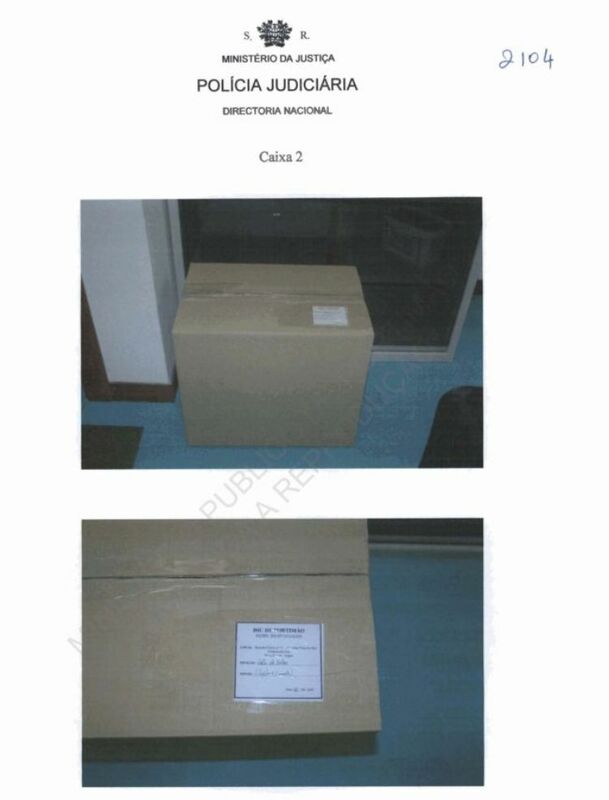 Clothes from the box labelled Lounge ("sitting room") were inspected by the blood dog between 00h02 (now 3 August) and 00h05 without any result. The same clothes were inspected by the cadaver dog between 00h06 and 00h07 also without any result. 4. 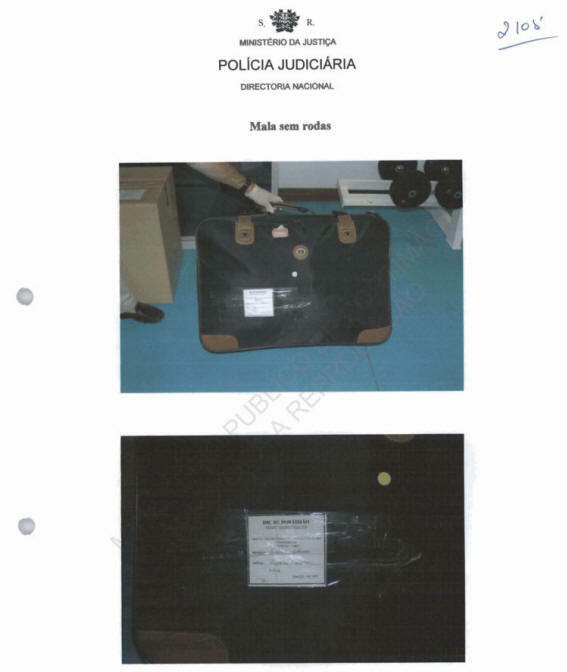 Then the suitcase labelled 'Twins bedroom' was inspected, followed by two sets of inspections of its contents due to the large number of individual pieces it contained: the blood dog inspected [the first set] between 00h12 and 00h15, and then [the second set] between 00h22 and 00h24 - both without any result. 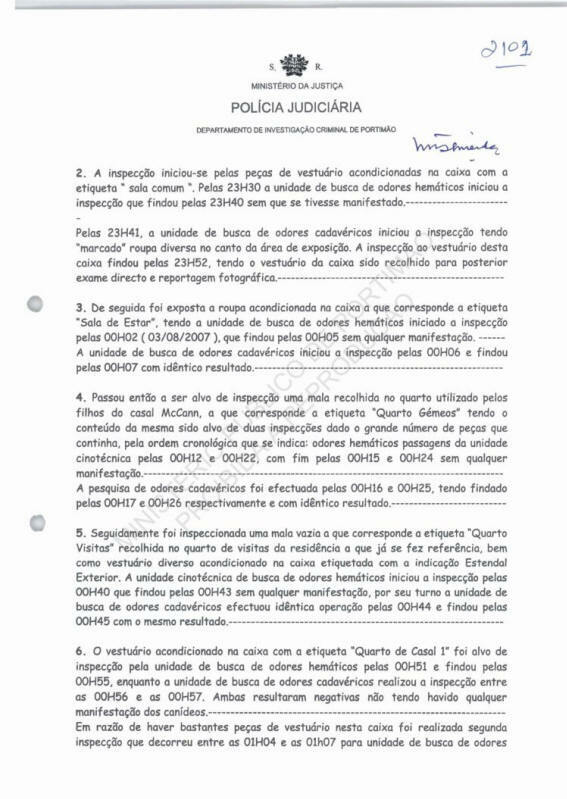 The cadaver dog inspected [set one] between 00h16 and 00h17, then [set two] between 00h25 and 00h26, also without any result. 5. 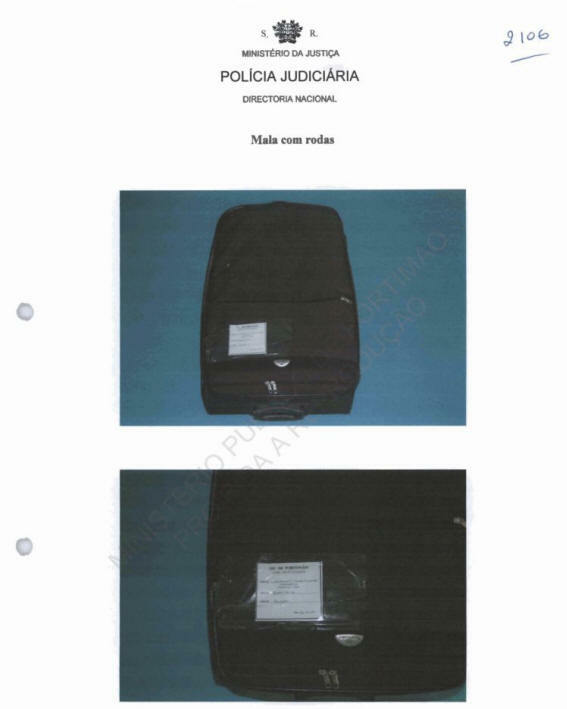 An empty suitcase labelled 'Visitors bedroom' was inspected, along with sundry clothing packed in a box labelled Outside Clothes rack. 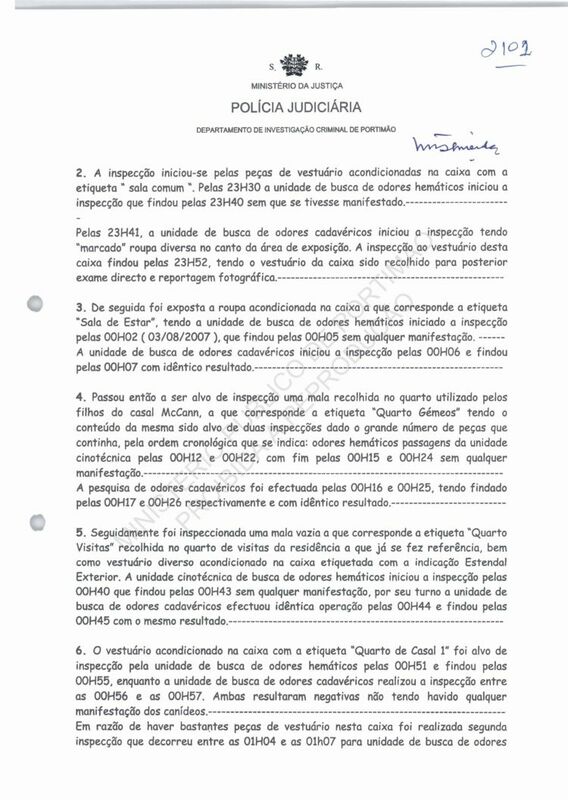 Between 00h40 and 00h43 the blood dog inspected without any result, and in its turn the cadaver dog inspected between 00h44 and 00h45, also without any result. 6. 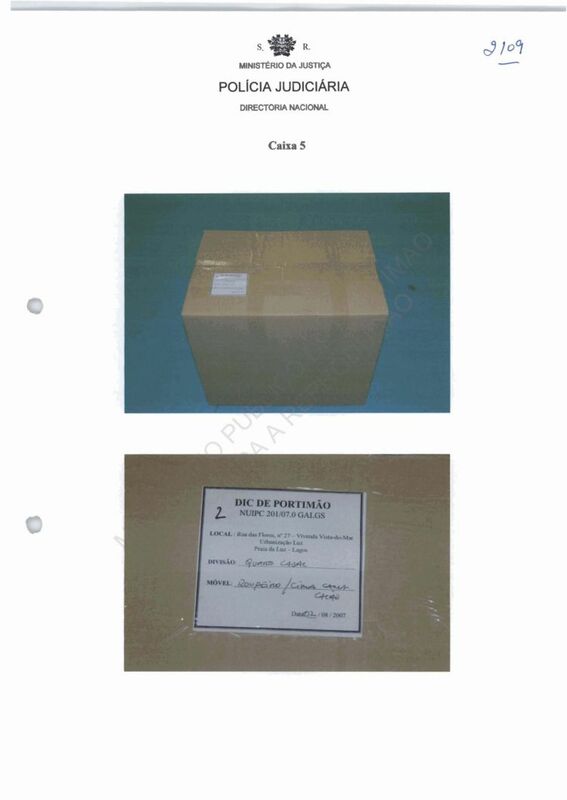 The clothes packed in the box labelled "couple's bedroom 1" was inspected by the blood dog between 00h51 and 00h55, while the cadaver dog inspected it between 00h56 and 0057 without any result from either dog. because there were so many pieces of clothing in the box a second inspection was conducted between 01h04 and 01h07 by the blood dog, and between 01h08 and 01h09 by the cadaver dog, [again] without any result from either dog. 7. 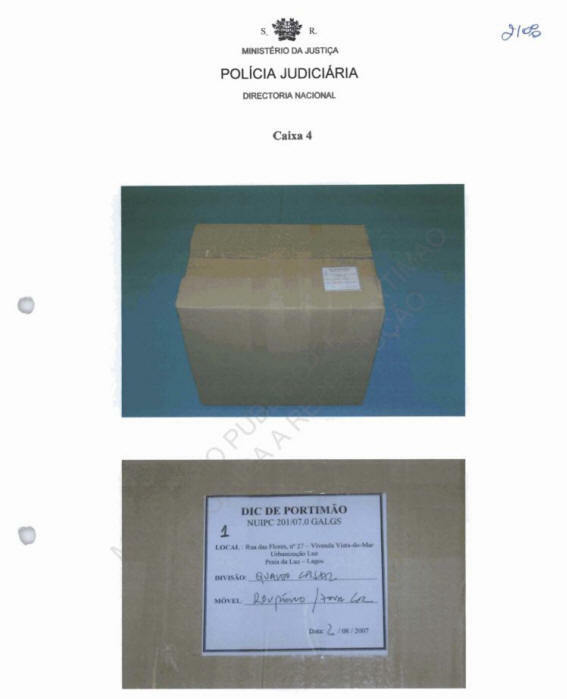 The clothes packed in the box labelled "couple's bedroom 2" was inspected by the cadaver dog between 01h20 and 01h22, then the blood dog between 01h23 and 01h25. Nothing abnormal was detected by either dog. 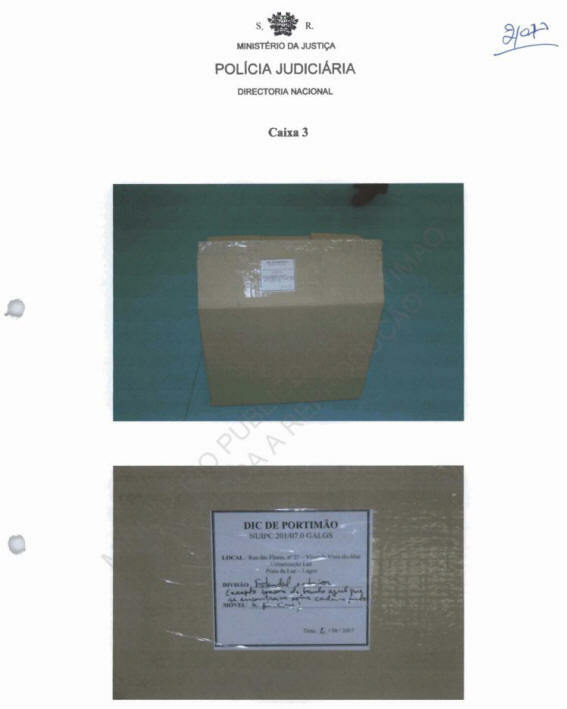 Attached, the photo report which immediately follows and the video recording on MiniDV cassette. There being nothing more the activity stopped at 01h30. 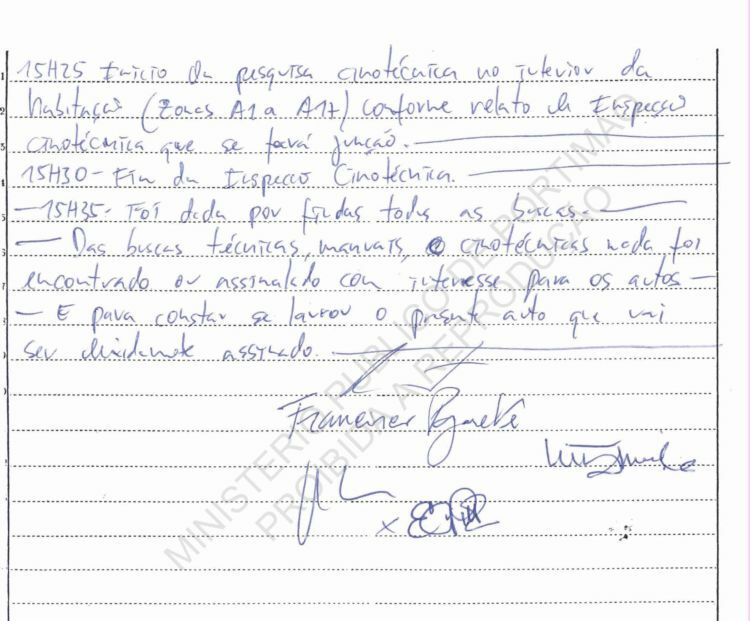 This document is drawn up to ratify the truth of the above and it is going to be signed by all participants. inside the residence of the arguido, at the above address. having been verified that the dog signalled [alerted to] nothing. verified that nothing was signalled [alerted to]. 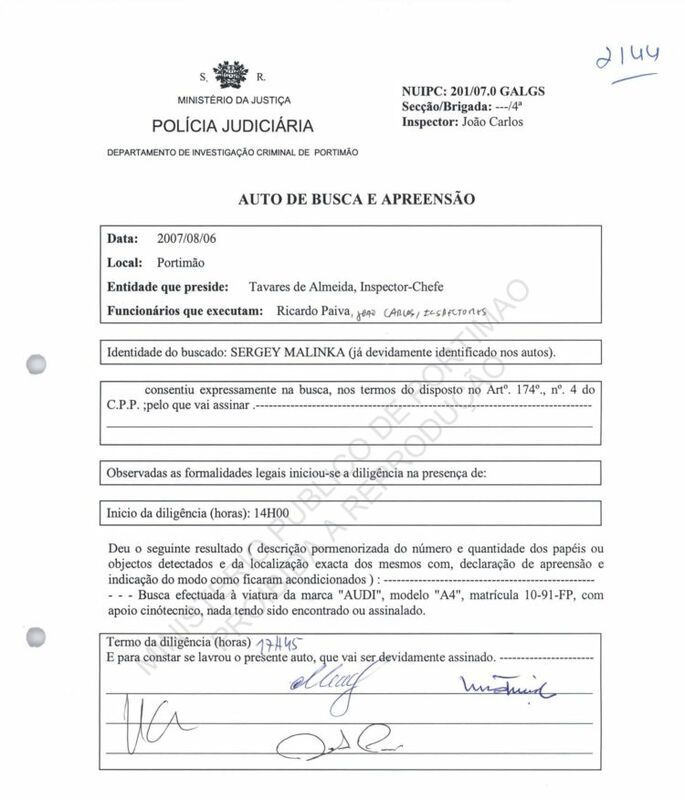 accordance with the inspection document [search and seizure warrant] attached.